Stress management is not a skill that comes naturally. It must be taught. I recall a health class early in my high school years in which we discussed stress management techniques: yelling into a pillow, writing in a journal, talking with a friend. As part of the unit of study, our class went to the football field to “scream out the stress.” I did more laughing than screaming. That was not the way I managed stress. I needed to zen out. Listen to music. Just sit outside in the quiet. Today, many students have a difficult time managing stress. Recently, Maureen Schlosser and I wrote separate posts about teaching mindfulness and using the library for quiet spaces. My post was spurred by two particular students I had recently encountered. One in particular regularly comes into my office, says “hey,” and sits at the table to talk. She calls me her therapist. I asked the Future Ready Librarians Facebook group to crowd source ways school librarians aid in stress management for students (and teachers). Below are just a few of the stress management offerings in school libraries. 1. Coffee carts, Keurig stations, and chocolate. Who doesn’t love a good pick-me-up during a stressful day? 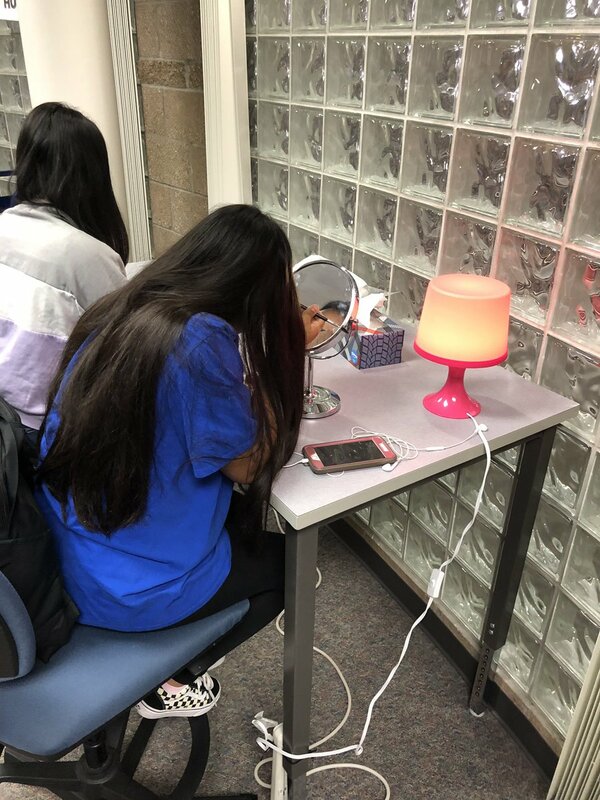 Check out Emily Simpao’s Teacher Recharging Station! Students are not the only ones that need a little stress management. 3. Therapy animals. 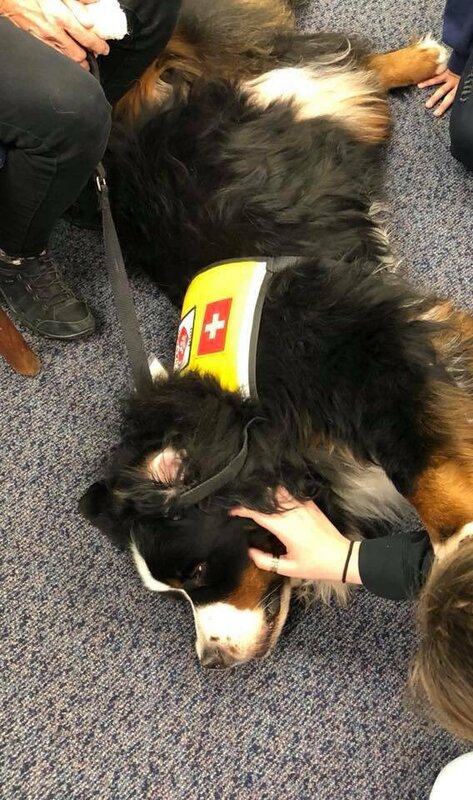 Jill, a Twitter friend in Oklahoma, regularly has a therapy dog visit her library. Bailey, a therapy dog that comes with his own handler, visits through the organization HALO. 5. Be a listening ear. Sometimes students (and teachers) just need someone to listen. I love the quote: “Most people do not listen with the intent to hear but with the intent to reply.” Let’s be the ones to listen with the intent to hear. 6. Make-up station. Traci Chun makes use of space for students who arrive early with a make-up station. This is such an awesome way to encourage students to use the library space and makes mornings less stressful for students. 7. Calming websites. Several times a week I recommend one of my favorite sites to zen out to students. 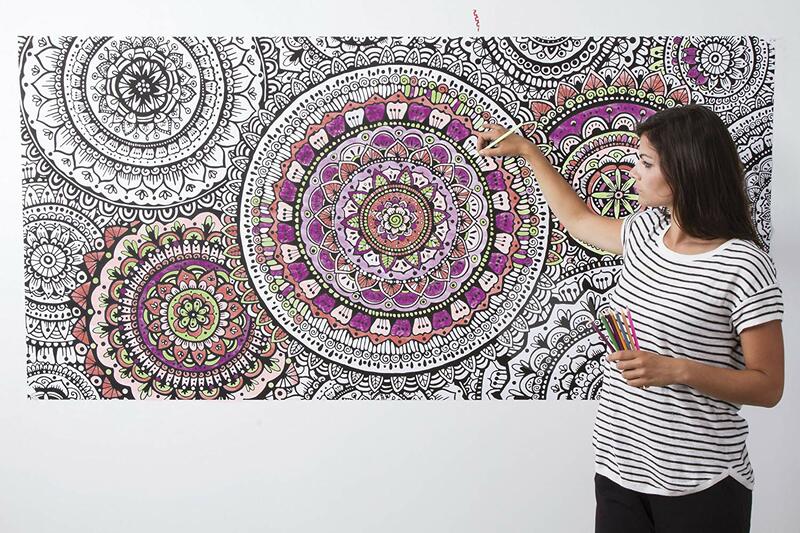 Weavesilk is an interactive coloring/design site that instantly calms me. Students really love to design cool images. You can see all of the crowd-sourced recommendations here. What other ways do you help students and teachers with stress management? What’s your favorite way to manage your stress? Teacher2Teacher shared this question on Twitter. Check out all of the awesome ways school librarians help their teachers and students de-stress! Here’s the link to my Tweet asking for ways you help teachers/students de-stress. The library is simply an amazing place to be! Wow! What innovative ways to help teach stress management and making it practical! I feel like this level of self-care is something that even some adults need to develop. Really great ideas! Thank you. This is absolutely true for adults, as well. I often find teachers scattered among students working puzzles, coloring, or just sitting quietly in a corner soaking up a moment of solitude. Be sure to check out the Facebook and Twitter threads for more amazing ideas. Our PLN is really a fantastic group of innovators!